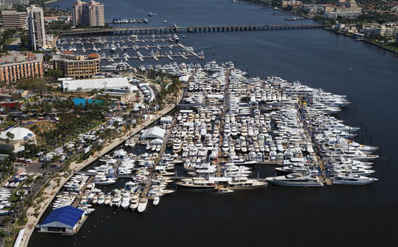 The 2012 Fort Lauderdale boat show will feature more than 1,000 boats in the water and on land. The six show sites will include more than 1200 exhibitors. The private jet traffic into the local airports turn the ramp areas into scenes from an aircraft carrier as well heeled boating and yachting enthusiasts attend this popular boat show. Sun Sentinel, the local newspaper, featured a guide to the show. Attending the Fort Lauderdale International Boat Show can be overwhelming unless you have a plan. With six sites, more than 1,200 exhibitors and miles of docks, you need to be prepared so you can get the most value and enjoyment out of the show. When to go: The first thing you need to determine is which day or days to go. The show always opens on a Thursday, which is known as Prime Time Preview. If you want to be among the first several thousand people to see the show, then you’ll pay the prime time price of $36 per ticket. If being first isn’t an issue, but you are looking to make a major purchase, then a two-day ticket for $38 is your best bet. Good for any two of the next four days of the show, it allows you to comparison shop for a boat, engine, electronics, safety gear, jewelry, artwork or clothing, then come back after you’ve had time to process everything and make a final decision. Thursday is often quite busy at the show, but Saturday and Sunday are traditionally the busiest days. Monday is the least crowded day and some exhibitors offer reduced prices on their goods just so they don’t have to pack them up and lug them back home. Park and cruise: Getting to the show can be easy or maddening. The basic rule of thumb is to park as far away from the Bahia Mar Yachting Center, which is the heart of the show, as you can. State Road A1A by Bahia Mar is usually jammed with cars and so is Southeast 17th Street Causeway near the convention center, which has a parking garage that fills up early in the day. The best options are to park off-site at War Memorial Park or in downtown Fort Lauderdale and take one of the free shuttle buses to the show. The buses start running at 9 a.m., an hour before the show opens each day, and continue until an hour after the show closes each day. The most enjoyable way to get to the show is by parking in one of the city or private lots or garages at the Las Olas Riverfront and taking the free riverboat to Bahia Mar. The riverboat captains often provide an entertaining and informative narrative of the route’s history and homes. Don’t miss: The docks along the Intracoastal Waterway have some of the world’s most magnificent motoryachts. If you’ve ever wondered how you’d spend a Powerball jackpot, check out these floating palaces. As you walk by the Swimming Hall of Fame, look on land to see the type of cars you could buy with your remaining winnings. If a smaller boat is more your style, the Broward County Convention Center has everything from flats and bay boats to center consoles and runabouts. If you just need a new outboard motor, the latest models from all the major companies will be there. If you’re a boat enthusiast like us then this is one you won’t want to miss out on. See you there! Be sure to come back to the Captains Blog for pics and video from the show!